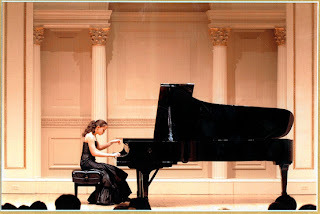 Sophia Chua playing Carnegie Hall at age 14. Now obviously, having never had my own Chinese mother, I cannot personally speak directly to their superiority or inferiority in regards to child rearing so I was curious as to how Mrs. Chua arrived at her conclusions. Before I began reading, I scanned the pictures of her children captured in various states of prodigiousness. There was a photo of her daughter Sophia playing piano at Carnegie Hall when she was just 14 and a picture of her other daughter Louisa practicing the violin in a hotel room. After scanning the photos, I was already beginning to suspect that my own standards for our future offspring were embarrassingly low since I would consider the absence of Federal prison time a feather in my son’s cap. 1. Hire only Chinese full-time nannies which may or may not provide the desired result and could possibly make me vulnerable to discrimination lawsuits. 2. Accommodate ethnically-specific polygamy into my existing family structure and belief-system. Items forbidden from her children’s lives at least until the age of 18 included watching TV, sleepovers, dating, appearing in school plays, receiving a grade less that an A in any subject, playing any instrument other than piano or violin, and choosing any of their own extra-curricular activities. She advocates hours of forced practice (both academically and musically) each day and believes that children must receive harsh criticism (she gives the example of calling overweight youngsters “fatty” and recalls how she referred to her own daughter as “garbage” when she was being disrespectful) in order to develop correctly. Shockingly, she even admits to threatening her daughter by withholding food when she would not cooperate with a piano lesson. She insists that no self-respecting Chinese mother allows their child to be less than the number one student in any subject other than drama or gym, and failure to achieve this is a direct result of the child’s (and parent’s) laziness and not intrinsic ineptitude. Amy believes that American mothers are too often uninvolved with their child’s academic success and overly concerned with their descendants’ fragile self-esteem. We are so worried about harming their delicate psyche that we do not push them to achieve the level of success that they are capable of. She believes that in this way, parents are actually doing the child a disservice that will hinder them the rest of their lives. To back up these claims she references several academic studies, but cites only one involving less than 100 mothers. My wife has been a public school teacher for many years now and I can confidently echo Chua’s sentiment about the lack of academic involvement displayed by many parents; but I am not certain that screaming out “Hey chubbs! I better hear some Rachmaninoff coming out of your bedroom in the next 5 seconds or I am going to feed you meatloaf to our over-achieving dog while you run vocabulary drills!” is the antidote. I wonder how such a structure exists in China. If every mother expects her child to be the top math student, what happens to the other 30 kids in that class whose mothers have that same expectation? What happens if the child has a learning disability or is autistic? How many pianists and violinists can one country produce? Are they ashamed of Yo-Yo Ma because he had the audacity to take up the cello? I am also disappointed that a Yale Law Professor cannot back up her claims with anything more convincing than an informal survey or 50 Western mothers and 48 Chinese immigrant mothers in a nation home to 82 million women with at least one child. I could amass a more viable sampling group by spending three hours in the diaper section at a Costco. While there may be some discernible benefits to Chua’s version of “Chinese motherhood,” I don’t believe I have the stomach for it. If the philosophy of every Chinese mother aligns with Amy’s, I have excluded the most frightening aspect of option number 2: having a Chinese mother-in-law…. The original essay by Amy Chua can be found here.